TThere are two minority villages around the lake that often receive visitors. On the south shores near the town of Lien Son lies Jun village, a fairly traditional M’nong settlement filled with rattan and wooden stilt houses. The villagers are surprisingly nonplussed about visitors, even though DakLak Tourist MAP GOOGLE MAP ( 0500-385 2246; www.daklaktourist.com.vn) has a small office and runs elephant rides (US$30 per hour). The second village of M’lieng is on the southwestern shore and can be reached by elephant or boat; enquire at DakLak Tourist. Accommodation standards in the two established midrange places have declined in recent years. Mr Duc at Cafe Duc Ma ( 0500-358 6280; 268 Ð Nguyen Tat Thanh; per person US$5) in the village can organise a stay in one of several traditional stilt longhouses, along with activities such as gong concerts, elephant rides, and kayaking or walking tours. ( 0905 424 239; Jun village; per person US$5) Very inviting, inexpensive new longhouse, with comfortable, screened beds in a well-kept communal room (with en suite). The restaurant (meals from 45,000d) is excellent, with lake fish, duck and salads. ( 0500-358 6184; www.daklaktourist.com.vn; r US$32-54) Pretend to live like a king at this isolated former royal residence on a hilltop overlooking the lake. It’s actually not that palatial, but there are six enormous rooms. The small cafe here serves drinks and meals (from 40,000d). Nine daily buses connecting Dalat (90,000d, four hours) and Buon Ma Thuot (25,000d, one hour) pass the lake. It’s also regularly visited on the Easy Rider trail. 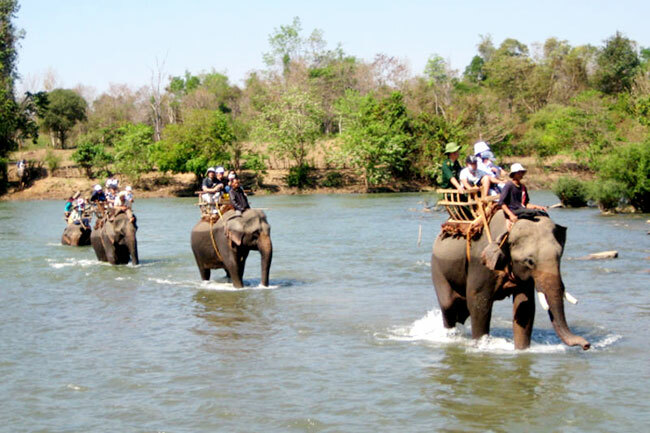 All the tour agencies in Buon Ma Thuot also offer tours.